Auckland is known as 'The City of Sails' beacuse of it's seafaring roots. The twin harbours of Waitemata and Manukau provide a fantastic water playground for a huge array of water activities and adventures. 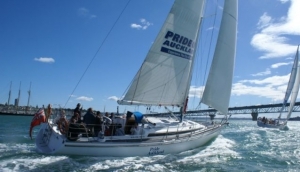 Scenic cruises around the harbour provide a relaxing way to see the iconic sights of Auckland and a number of the larger islands that dot the Hauraki Gulf. For those who prefer a little more speed, there is the chance to race in an America's Cup yacht, or hop in a jet boat for a whistle stop tour of Waitemata Harbour. Fishing trips that double up as scenic cruises are a popular activity while the ferry service from the terminal on Quay Street, gives visitors access to many of the nearby Islands, including the Island of Wine, 'Waiheke', and its many vineyards and glorious beaches. With more time on your hands, chartering your own luxury yacht gives you the freedom to explore the incredible setting of Auckland and beyond. A visit to Auckland is about getting on the water, so there's no shortage of water activities to keep you entertained.